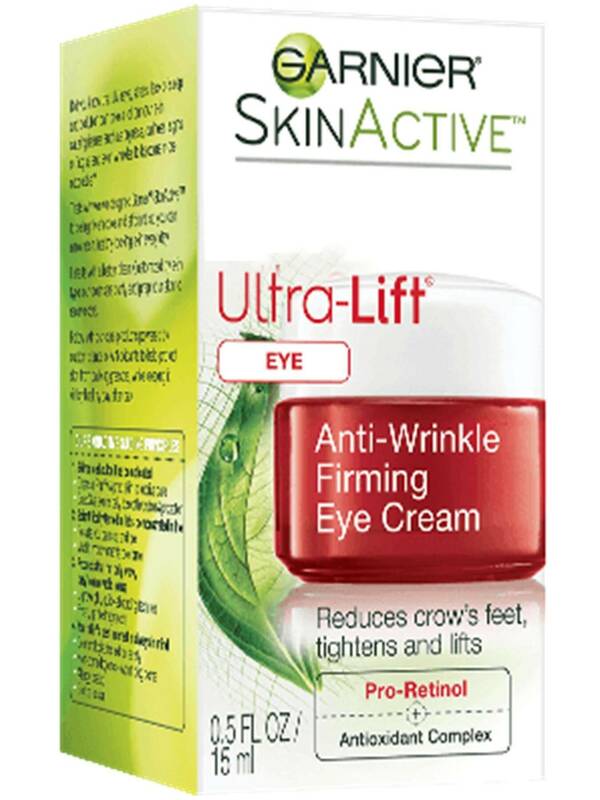 Reduces crow's feet, tightens and lifts. Lift away signs of aging and start seeing visible results quickly! A multi-tasking eye cream with Pro-Retinol from nature (A form of Vitamin A), Caffeine and Rice Peptides. It deeply hydrates and brightens the eye area while fighting the look of wrinkles and improving elasticity. Gently dab Ultra-Lift Anti-Wrinkle Firming Eye Cream every morning and night under eyes, around outer corners, and over eyelids. After cleansing, use Ultra-Lift Anti-Wrinkle Firming Moisturizer SPF 15 as your daily moisturizer. After, dab Ultra-Lift Anti-Wrinkle Firming Eye cream around the delicate eye area, morning and night. Rated 3 out of 5 by mak222 from Garnier Ultra Lift eye cream This eye cream is good, just not amazing. I would like to use it longer than the 4 weeks for this review, to see if I would notice any changes. This cream is thick and able to be smoothed into your skin easily without a greasy effect. One downfall is I prefer a cream where I do not dip my fingers into a jar, rather squeeze out, to keep germs to a minimum. I liked it for night time use more than day use. I could put a good amount on and let it moisturizer over night. I did not see any noticeable decrease in fine lines or wrinkles. I will continue to use this eye cream and give it more time to work on these fine lines! Rated 4 out of 5 by roscap14 from Younger eyes Well now that I'm in my 40's, I'm not getting any younger. 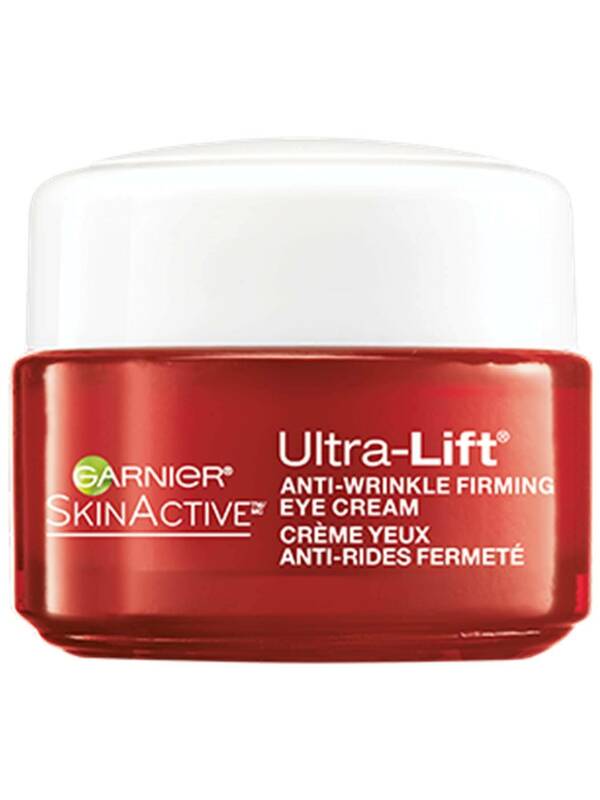 But I've been trying new products to look better.I tried Garnier skin Active Ultra-Lift Anti-Wrinkle Firming eye cream. Long name I know. But want you to get the name. I used for 3 weeks. Every morning and night. I found that it worked, not like magic. It takes time and you need to use it right. My eye area is wrinkle reduced, hydrated, refreshed. I feel and look a little younger. I will continue use. Rated 4 out of 5 by Ohmycosh09 from Good stuff! I really liked this eye cream. It's light weight and does not burn. It has little to no scent which I love! I've been using it at night for about two weeks and I love it! I've noticed it's quite hydrating! Rated 5 out of 5 by khillstar37 from Much less expensive We used some Garnier Eye Creme on some wrinkles, crows feet, and baggy eyelids. After daily use, in the morning and at night there were noticeable improvements within just two weeks. My mom has been using a department store eye creme that costs almost four times more. Of course after seeing the results it was easy for me to recommend it to her, some other family members, and my closest friends. I can't wait to see the improvements with the continued use which can be seen in the BEFORE and AFTER picture I enclosed. Thanks for making such a wonderful product and I'll be on the look out for more of the same from Garnier. Rated 4 out of 5 by Linnaw05 from Wrinkles beware! This was a nice cream. It didn't have the slightest odor which I liked a lot and you didn't have to put on a lot. A little goes a long way. The cream feels light when you put it on. I have used it consistently for a week and I can see just a little "magic". We will have to see as the weeks go on just how good it works.